Oregon's 2017 QUALITY DEALER of the YEAR - LOTUS of PORTLAND! 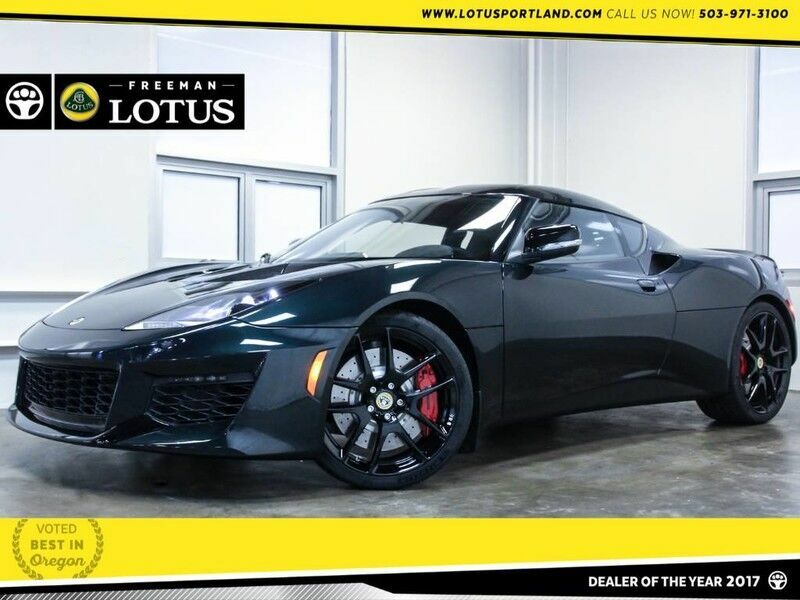 2018 Lotus Evora 400 2+2. The Lotus Evora embodies the spirit of Lotus through an exquisite power-to-weight ratio and succinct handling. With a 3.5 liter Supercharged V6 producing 400 HP, this everyday super can accelerate from 0-60 comes in 4.1 seconds. The Evora 400 isn't just fast, it's beautifully designed inside and out. This particular Evora features the Black Pack, Alcantara Pack, Subwoofer, Cruise Control, Gloss Black Forged Wheels, Carbon Fiber Access Panel, Carbon Fiber Rear Tailgate, and a 6-Speed Manual Transmission. Come see why the Northwest buys their performance cars from the Freeman Motor Company. Please call for additional details and to reserve a priority viewing of this car. Secure hold deposits available upon request. We offer financing options and extended service contracts to add to your peace of mind. Stop by our all-indoor showroom and enjoy the no pressure buying atmosphere. For 28 years, Freeman Motor Company has surpassed the stereotypical dealership by demonstrating unrivaled integrity and professionalism. Our expert service technicians inspect each vehicle before entering our showroom. We specialize in Audi, Mercedes, BMW, Jaguar, Land Rover / Range Rover, Porsche, Volkswagen VW, Volvo and Mini Cooper. Before you purchase a Ferrari, Bentley, Aston Martin, Lamborghini, or a Rolls Royce, come see how you could Drive Away Confident. Freeman works with local clients from Nike, Adidas, Intel, Boeing Co., Columbia Sportswear, Freightliner, Legacy Health Systems, Providence Health Systems, OHSU, Tektronix, and others. We appreciate the opportunity to support our community.